Members and readers of this blog my be interested in a new book I have published entitled Text and Story. It has just appeared and is available through the publisher. It will also be available on Amazon, etc in about a month. I hope to see many of the blog members at SBL in San Francisco. Here is a (fairly) new blog of interest: Byzantine News, with related facebookpage. Here, for example, you find links to interesting clips showing how to write Byzantine Greek minuscule script and ligatures, or how to draw Byzantine icons. Throughout the Middle Ages, the Bible was one of the most copied texts in the Christian world. As a sacred text, it was widely commented, rewritten and put to various uses in different contexts and with different purposes. It reflects the various changes that writing systems and technologies underwent; not surprisingly, it was the first book to be printed. Wherever one looks, the Bible gave rise to the most sophisticated expressions of the medieval craft of book-making. Biblical texts and manuscripts have for a long time attracted the attention of philologists, exegetes and historians; however, things are different when it comes to the artefacts that gave the Bible its material existence. Although the production of biblical books in certain periods and a few exceptional manuscripts have already been studied in detail, we are still very far from being able to build a historical typology of biblical books. To achieve this aim, it seems necessary to adopt a global and a comparative perspective. Therefore, a particular effort needs to be made to highlight the manner in which the difficulties involved in the material process of making the sacred book have been resolved at different points in time and in different countries. This conference intends to establish the state of the art with respect to Bible making from late Antiquity to the fifteenth century, while also opening up new perspectives for future research. In order to promote a comparative and comprehensive approach to these issues without losing focus, the conference will concentrate on Bible making in the West (both in Latin and in the vernaculars) as well as in the Byzantine and Hebraic parts of the Mediterranean world. The conference organizers look forward to receiving proposals that centre on the material aspects of Bible books and especially those that adopt a wide-ranging approach; reports on finished or ongoing research are both welcome. Case-studies on isolated textual witnesses will only be considered if they shed new light on production modes and technical aspects that can be shown to have a wider currency. Similarly, paper proposals addressing cultural aspects (e.g. contexts of production and reception), philological aspects (e.g. issues of text transmission, the set-up of books and prologues, paratextual features) or iconographic ones (e.g. the decorative apparatus) should preferably address their interaction with the books’ material aspects (structure of the volumes, lay-out, readability...). * the entire Bible text, or a part of it, prepared for liturgical uses (evangelical books, psalters), with the exception, however, of liturgical books which include non-biblical materials (missals, breviaries, books of hours). Abstracts (maximum 500 words) are to be sent before 30 September 2011 to chiara.ruzzier@fundp.ac.be. Confirmation of acceptance will be given as soon as possible. A small number of grants are available for junior scholars and PhD students who have no access to institutional funding. Please send your application (including a short CV) to chiara.ruzzier@fundp.ac.be. Does anyone know of a searchable KJV text (original spelling or modern) which also shows the marginalia? Sometimes I despair that so much knowledge that was once standard is now hardly known and that therefore its rediscovery becomes the source for proud scholarly papers and articles. C(h)risimon. Haec sola ex voluntate uniuscuiusque ad aliquid notandum ponitur. How many of us will have tried to find some Christological link when seeing the Chi / Rho sign in the margin of a manuscript? As Peter mentions in the previous blogpost, Brice Jones has published an article in JGRChJ 8 (2011) on ‘The Bodmer ‘Miscellaneous’ Codex and the Crosby-Schøyen Codex MS 193: A New Proposal.’ Congratulations to him for the successful publication! I have actually had some correspondence with Jones about these codices, but was not quite aware then that he would eventually write an article on the subject (by then he was preparing a presentation for a graduate seminar at Yale). Anyway, he asked me at one point, in reference to my 2005 NTS article on the subject,”Papyrus 72 and the Bodmer Miscellaneous Codex,” NTS 51 (2005): 137-54, whether it was necessary to call this Bodmer Codex (which among other writings contains P72, with 1-2 Peter and Jude) a ‘miscellaneous’ codex, since there appear to be several different viable themes of this codex and not just one, and whether we should not stick with Turner’s initial judgment of the Bodmer Codex as a “composite” codex. It is very important that you read a later study which is focused on the question your raise, i.e., about a possible theme and “miscellaneous” vs. “composite”.... I wrote that later study together with Tobias Nicklas, didn’t I send you a reference to that? Anyway, my NTS article is mainly focused around the question how the codex was made up of several earlier collections - so that in itself speaks against one pervasive theme (which I point out). On the other hand, it is clear to me that the separate parts were produced in a proto-orthodox environment (if I may use the term “proto-orthodox”), in which Christology apparently is important. This does not mean that Christology is a theme - did I say that? There are liturgical connections between earlier parts of the collection, by the way. But, please read my other essay on the Bodmer Misc. Codex. No, I don’t believe we should call it a composite. In the later essay we suggest that it is something in between. But read it an[d] come back. Nevertheless, Jones suggests in his now published article that I have argued “for a general christological theme” of this codex (p. 12). So, in this blogpost I will try to clarify and develop my standpoint, which I briefly tried to convey in that reply cited above. I realize that I have not been “black or white” on this particular issue, especially not in my NTS article, and perhaps consciously so, since I find this codex and its make up to be both fascinating, but at the same time a bit mysterious. The final collector may have had one particular theme in mind, but more probably this person somehow found a common denominator in the texts, and, therefore, Martin’s original proposal of an apologetic collection does not have to be dismissed as being too general a characterization. In fact, several characteristics typical of incipient orthodoxy are prominent in the texts, especially in the area of Christology. Several scholars have suggested that there were certain theological reasons for the composition, and, indeed, the texts of the codex betray the influence of incipient orthodoxy, but to single out one specific theme is problematic, since the codex is made up of several earlier collections. There are, I suggest, some features that unite more or less all the texts in the collection – they are not just like any random collection of writings. So is “composite” a suitable term? And, perhaps more significant, are the two general categories “composite” and “miscellany” clear and adequate to represent what we find in extant multi-text MSS? As I replied to Jones, I have suggested, in a subsequent essay, which I have co-written with Tobias Nicklas in German (which Jones refers to in footnote 15), that the Bodmer codex is something in between “composite” and “miscellany” (as these terms are usually defined). I am a bit surprised that this suggestion is not discussed or mentioned in Jones’ recent article. Lying behind the title ‘composite’ given to these two codices [including the Bodmer codex in consideration] that scribes did not care to waste writing material and would wish to fill any free pages left over at the end of a codex. Even if the matter chosen as filling was too long, in a quire of multiple gatherings additional gatherings could be added if required. (Typology, 81). So, is this the kind of sole (pragmatic) motivation lying behind the collection of writings brought together in the Bodmer codex under consideration? “– I mustn’t waste any writing material when copying this work I want to copy (and/or collect).” I think not. Turner then, by the way, goes on to problematize the notion of “composite codices” as he compares them with some papyrus rolls that are heterogenous in content. For example he refers to BM Pap. 133+134. The first part of this roll contains nine columns of a speech of Hyperides. After a blank space of about 30 cm. a second scribe copied the Third Letter of Demosthenes. Turner then considers the difference between such rolls, and composite codices containing heterogeneous material as the Bodmer codex concluding that one should probably see in the latter “a growing recognition of the comprehensive character of a codex” (p. 82). Interestingly, in the same monastic library, to which this Bodmer codex belonged, there were in fact a number of classical texts, most often not bound together with theological or liturgical texts, but, significantly, there is at least one exception to this rule (I just quickly browsed the inventory). One codex contains Cicero’s in Cantilinam (in Latin); Psalmus Responsorius (in Latin); A Greek liturgical text; Alcestis (in Latin). Should the Bodmer Misc. Codex be classified in the same category as such a collection of diverse material found in this codex?, i.e., a composite codex? I think not. What expectations do modern readers generally have of books and the contents of books? 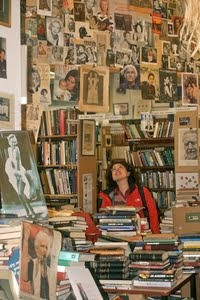 When we go to the bookstore and browse, we usually find inside the covers one novel, or one biography, or a manual over one kind of technical equipment; the book is probably written by one author or maybe by more than one author but collaboratively, as in the collective novel. But there are other models: a book can hold the collected works by one and the same author, or a choice of those works (or just part of one work—when the work in its entirety is too long to fit into just one volume). It can be a collection of essays by different authors but over a common theme. It could cover, say, Polish poetry from the interwar period. Whenever there are more than one text in the book, we can easily find a common denominator [sic!] for the text collection. What we do not expect to find is a book which contains one text on computer programming, followed by one text on effective bargaining, followed by George Orwell’s Animal Farm, followed by an enumeration of household remedies against migraine or ulceritis. I might, as a reader, be interested in all of these things, but they do not belong in the same book. Note the focus here on the reader’s expectation and function. Many of the terminological discrepancies originate in different ways of dealing with this complexity. An obvious example is the term miscellany or miscellaneous codex which seems to have been given as many definitions as there are scholars in this area. Should this term cover all kinds of multitext books, both the structurally homogeneous and the composite codices? Should it designate only the contentually heterogeneous or should we include other possible text combinations as well: different texts by the same author (corpora), different kinds of texts which have a common use (e.g. liturgical text collections)? Would collections of excerpts qualify, or must the texts be complete? I have tried to avoid this problem by using the overall term “multitext book” for the whole field, regardless of structural differences and regardless of how similar or diverse the texts seem. Some prefer to use the term miscellany in contrast to the composite, so that the miscellany would always be monomerous or at least homogenetic, i.e. produced in the same circle and approximately at the same time. Brice C. Jones, ‘The Bodmer ‘Miscellaneous’ Codex and the Crosby-Schøyen Codex MS 193: A New Proposal’ JGRChJ 8 (2011). Generally useful survey. The new proposal would seem to be that we should think of these as composite codices, lacking any thematic coherence. Don Barker, ‘The Dating of New Testament Papyri’ NTS 57 (2011), 571-582. The narrow dating of some of the early New Testament papyri and the methodological approach that is used must be brought into question in the light of the acknowledged difficulties with palaeographical dating and especially the use of assigned dated literary papyri. The thesis of this paper is that the way forward in dating New Testament papyri, or for that matter any undated literary papyri, is first to locate the manuscript in its graphic stream and using, on the whole, dated documentary papyri belonging to the same stream, come to an approximate understanding of where in the history of the stream the manuscript lies. The following New Testament Papyri will be so treated: P52, P67+ and P46. The German Bible Society has taken the revolutionary and enlightened step of putting its Bibles (NA27, BHS, Vulgate, 'LXX', etc.) freely online. See here. 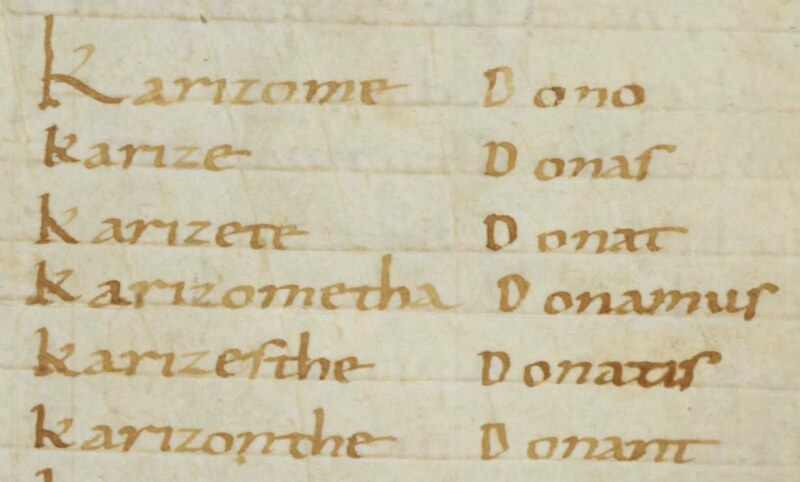 In a comment to the previous blog post, the question was raised regarding variation in the order of books in NT manuscripts. Two good resources re this issue include Bruce Metzger’s book on the NT canon (OUP, 1987), which includes a section on variations in the order of books (and also groups of books) in the NT, and an appendix in the back of at least two, probably three (and perhaps all four) of the volumes by Reuben Swanson on the text of Romans, 1 Corinthians, 2 Corithians, and Galatians. In this appendix Swanson lists the order of books in a substantial number of NT manuscripts (papyri, majuscules, and minuscules). 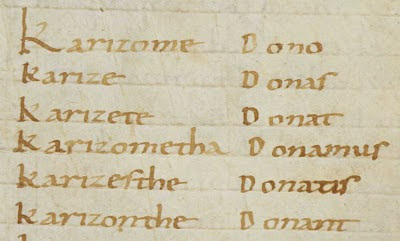 Examples of unusual arrangements among the MSS Swanson lists include 33, which in its current state presents this sequence: the text of the OT Prophets is followed by (starting at the top of a right-hand page) 1 Cor, 2 Cor, Gal, Eph, Phil, Col, 1 Th, 2 Th, Heb, 1 Tim, 2 Tim, Titus, Philemon. Then comes (starting on a fresh page) a section of 8 pages containing a prologue for the Catholic letters; hypotheses for James, 1 Peter, 2 Peter, 1 John, 2 John, and 3 John (presumably, as the heading is only partially readable; there does not appear to be a hypothesis for Jude); hypotheses for Romans, 1 Cor (? 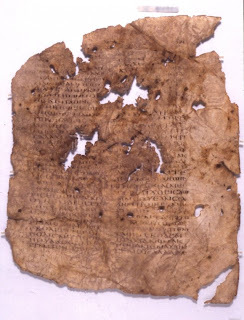 ; heading obscured/unreadable), 2 Cor, one hypothesis with an obscured/unreadable heading, Phil, Col, 1-2 Thess, 1-2 Tim, Titus, and Philemon. Then comes (beginning on the same page as the hypothesis for Philemon) the text of Acts, Jas, 1 Pet, 2 Pet, 1 Jn, 2 Jn, 3 Jn, Jude, Romans, Matt, Mark, Luke, John. The unusual position of the gospels is due to a binder’s error, acc. to Scrivener; the gospels orginally followed the Prophets. The position of Romans after Jude, however, is not the result of a binder’s error; Romans begins on the same page on which Jude ends. There is one more oddity about Romans in 33: its strongly Byzantine textual character (if I read the information in Text und Textwert correctly) is significantly different from the textual character of the other Pauline letters in the manuscript. Did the scribe of 33 work from an exemplar that was missing Romans, which was then added in later (from a different exemplar) at the end of the manuscript? In all, a most curious situation. At the time that Codex Sinaiticus was made, around the middle of the 4th century, there was no agreement as to which books constituted the Bible, or the order in which they should be arranged. Indeed, before this date there had been no concept of the Bible as a single volume, containing all those texts familiar to modern readers. I would suggest firstly that the lack of complete agreement (as exhibited in minor differences within fourth century canon lists and differences in the order of books in extant manuscripts) should not be presented as if this implies that "there was no agreement as to which books constituted the Bible", since for the most part and for the core books there clearly was widespread agreement. Secondly, even though it is the case that the order of books takes on a different significance when they are all bound in a single codex, conventions of ordering were clearly in place in the period before the fourth century. Such conventions of ordering can be seen in a variety of places both internal to the sub-collections which make up the NT (e.g. P46 for Paul; P45 for Gospels & Acts), and in discussions reflecting on the developing NT as a whole (Irenaeus, Muratorian Canon etc.). It is not random that the Gospels precede the apostolic witness. So yes there is no completely settled order for the NT books (nor is there after Sinaiticus since it is only printing that brings all the books together for the masses), but that does not mean there were no areas of general agreement in relation to the ordering of the books. Thirdly, it is in principle very unlikely that Sinaiticus is the first manuscript of the Bible (both because Vaticanus is probably earlier, and because there may have been several hundred other earlier mss now lost). So we don't know whether a Bible in a single volume had actually been physically constructed well before Sinaiticus. If we are talking not about physical artefacts but about the capacity to conceptualise the various bits of the NT as a single collection then we might have several candidates. So these points need a rather more nuanced presentation in my opinion. To create Codex Sinaiticus required the collaboration of arguably four scribes (designated by modern scholars A, B1, B2 and D), working from approximately thirty exemplars. In order to expedite the process, the scribes would have copied different parts of the text at the same time, dividing the work between them. For example, Scribe D is known to have copied Genesis and portions of Matthew, Mark and Luke (in addition to other books of the Bible); while Scribe A produced large chunks of the Old Testament, and most of the New Testament, including Acts. Firstly a minor problem here is the division of B into B1 and B2. So far there is no scholarly publication in any format outside the Sinaiticus project web-site that argues the case for the separation of B into two scribes. The case for this has never been made in a published forum (I don't recall it even being affirmed in Parker's book on Sinaiticus, although I could be wrong on that). Secondly, this notion that the scribes worked from 'thirty exemplars' is rather interesting. I would love to see the evidence behind this assertion. I presume that doesn't mean 30 for the NT, as if every separate text had its own separate exemplar (that would not be plausible), but 30 for the whole Bible (including the bits of the OT that we no longer have). One could easily imagine 6-10 exemplars for the NT, but moving from imagining it to actually constructing an argument on the basis of some evidence would require some interesting work. Thirdly, the notion that Scribe D's work on portions of Matthew, Mark and Luke is an example of dividing the work to expedite the process is clearly wrong; since scribe D is working to replace sheets within quires that are otherwise the work of scribe A. The author should have read Jongkind.